With Valentine’s Day right around the corner, you don’t want to struggle locating the perfect gift. Of course, if you and your Valentine are cruise lovers, the ideal gift would be a surprise trip on your favorite cruise line! But if you’re already booked, these gift ideas would work well for the cruise lover. Lightweight Spinner Luggage: Haven’t upgraded your luggage lately? You’ll be amazed at the latest advancements. A piece of luggage with spinner wheels has wheels on all four corners and can be guided left, right, forward and backward with next to no pressure. It’s perfect for weaving in and out of crowded terminals while saving your back for snorkeling. 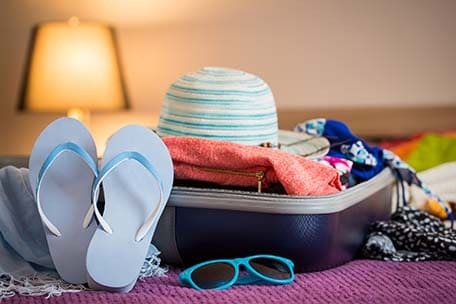 Packing Cubes: Most cruisers want to take as many things as possible without going over luggage weight regulations. With packing cubes, which aren’t heavy enough to register on a scale, you can organize your items to fit more into a smaller space. Travel Charger: Cruises are very visual experiences, and cruisers love to share on social media. Therefore, a travel charger is almost a necessity. Some chargers can power more than one device at a time, and most have USB ports, as well. 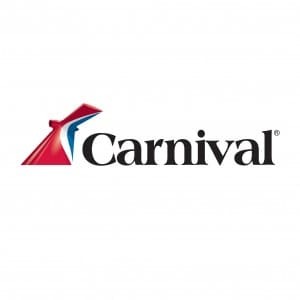 Universal Adapter: Carnival provides both 110 and 220 outlets. With a universal adapter, you can take advantage of all the available outlets. Clear Plastic Over-the-Door Hanging Bag: You won’t want to waste a minute looking for your keys, wallet, cell phone or suntan lotion. A lightweight clear plastic organizer is the perfect way to stay organized. eBook Readers: If you or your cruise partner are book lovers, you’ll probably spend quite a bit of time reading while you soak up the sun. An eBook reader is small, lightweight and can hold hundreds of books for your enjoyment. Walkie-Talkies: Walkie-talkies are the best way to stay in touch with your Valentine while on a cruise if you’re doing separate activities. One of you may want to relax with a luxurious spa treatment, while the other wants to enjoy the water slides at Waterworks. It’s easy to stay in touch and connect afterwards with walkie-talkies. Binoculars: Cruises are all about breathtaking scenery and new experiences. You’ll get the most out of your cruise if you can see things close up. Whether you’re in the Caribbean or Alaska, you will discover hidden gems and animal life galore; make sure you can see them in detail with a good pair of binoculars. 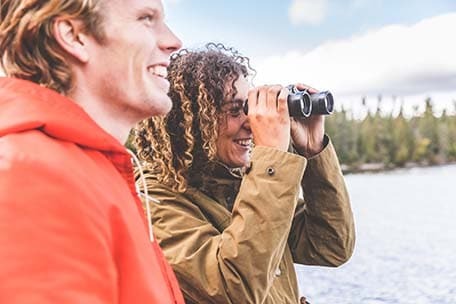 Waterproof Camera: You can purchase single-use waterproof cameras, but if you’re a shutterbug, your own waterproof camera will let you get the best shots of under-the-sea wildlife. Furthermore, you’d have a waterproof camera that is digital, and takes photos and videos you can share with friends. Travel Journal: Plan a few romantic days and nights for your next cruise, and capture them in a travel journal. You’ll also find it useful to remember where you found that beautiful scarf, or the name of that cute town you want to revisit on your next cruise. Nautical Accessories: For her, try jewelry or accessories with a nautical theme, such as seahorse earrings, an anchor-themed scarf or a cruise ship charm for her bracelet. For him, nautical-themed ties are always in style. 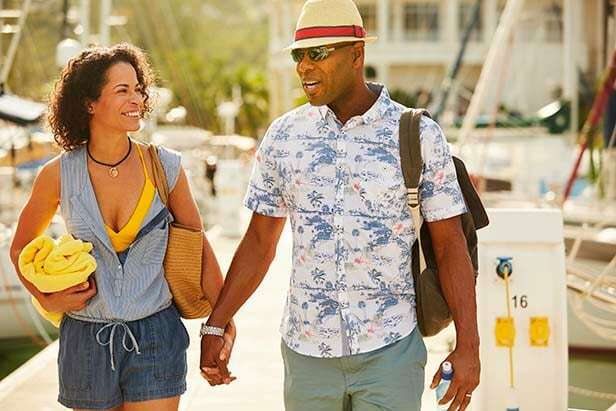 Cruise-Friendly Clothing: For warm-weather cruising, both of you will appreciate looking good and being comfortable in tops and shorts made from wrinkle-resistant, moisture-wicking material. Look for materials with trade names like Dri-Fit, Dri-Power, Dri-Release and Coolmax. Valentine’s Day is a time to celebrate your relationship. It’s easy to go beyond the standard chocolates and dinner routine when you can amaze your Valentine with a surprise cruise, or choose from a selection of gifts that any cruise lover will appreciate.